“Oh Deer!” you may say as you step outside into the freezing winter. But you’re not worried, as you quickly pull your mittens out from your coat pockets to keep the cold out! 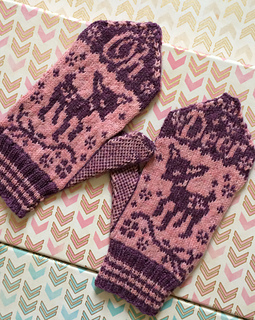 Adorable retro deer and foliage adorn these kitschy pink and purple mittens. The backs (palm-sides) feature a chevron motif, which then morphs into a retro floral pattern. 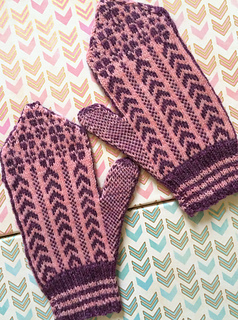 I developed this pattern using traditional Nordic and Scandinavian knitting techniques, then added my own twist. These are a size women’s medium or a men’s small. 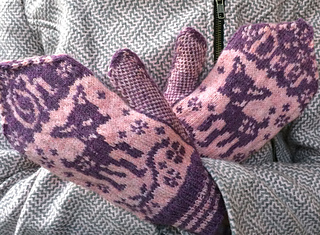 For larger or smaller mittens, I recommend going up or down in needle size first before subbing out a heavier or lighter yarn weight.